Its 4am at the military base in the northern part of Borno state, the camp commander has just received intelligence that heavily armed insurgents have been spotted advancing into a neighbouring town. The commander immediately rallies the troops and orders an immediate assault on the convoy of insurgents. However, several soldiers in the battalion refuse to engage the enemy because they believe the insurgents have superior fire power and refuse to obey the commander’s orders. Tempers flare, a brawl ensues among the troops and the commander is shot at by a junior officer spear heading the conflict. The military police have however calmed the situation and the officer who shot the pistol during the brawl has been arrested and will be facing a Court-Martial. This blog post is the first of a series relating to crimes and punishment under the Armed Forces Act, Cap C20, Laws of the Federal Republic of Nigeria (2004). 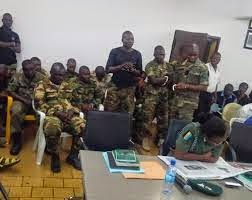 Currently, over 200 Military personnel are undergoing a Court-Martial for several offences including mutiny, assault, misconduct and tampering with military property. Though some are being tried for lesser offences, about 12 have been found guilty of the act of mutiny and sentenced to life imprisonment, a punishment that was commuted from the initial death sentence handed down for shooting at a vehicle conveying their commander. Overthrow or resist lawful authority in the Federation. Impede the performance of any duty or service in the Federation or in any arm of service of the Armed Forces or in any force cooperating with the armed forces or in any part of the armed forces. The law further provides in the same section that any person who takes part in a mutiny involving the use of violence or the threat of the use of violence or having as its object or one of its objects the refusal or avoidance of any duty or service against, or in connection with operations against the enemy, or the impeding of the performance of that duty or service or anyone who incites other persons who are also subject to service law to take part in a mutiny, whether actual or intended is guilty of an offence under the law and liable on conviction by a Court-Martial to suffer death. Furthermore, any person not falling under the above, who takes part in a mutiny, or incites any person subject to service law to take part in a mutiny, whether actual or intended is guilty of an offence and liable on conviction to life in prison.